Laurie Kingery here—this month I decided to tell you about one of the most famous Texas Rangers of all, John Salmon Ford, who was better known as "Rip" Ford for his practice of listing "R.I.P." (Rest in peace) after every name on his company's casualty lists when he served in the Mexican-American War. Rip Ford was not born in Texas, but in South Carolina, in 1815. He grew up in Tennessee. He married Mary Davis there, but when the marriage ended in divorce, he left for Texas, which was then fighting for its independence from Mexico, but he arrived too late to assist Texas in that. He served in the Texas army until 1838, then opened a medical practice in San Augustine. He also became a lawyer before winning election to the state legislature in 1844, and was a proponent of annexation of the republic to the U.S. as a state. He then moved to Austin and ran the Texas Democrat newspaper. 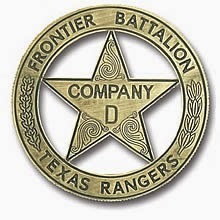 When the Mexican War began, Ford joined John Coffee Hays' regiment of Texas Mounted Rifles. He was immediately appointed a lieutenant and served as a medical officer, adjutant and scout. It was here he earned his nickname of "Rip." Following the war, he explored the country between San Antonio and El Paso. 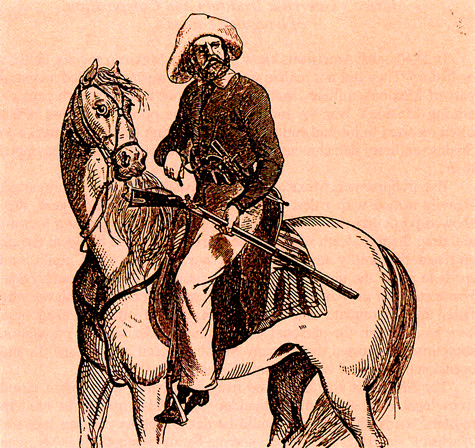 He was made a captain in the Texas Rangers and stationed between the Nueces and Rio Grande Rivers, where he had several fights with the Indians. In 1858, he became a senior captain in the state troops, and defeated hostile Indians in the Battle of Little Robe Creek. 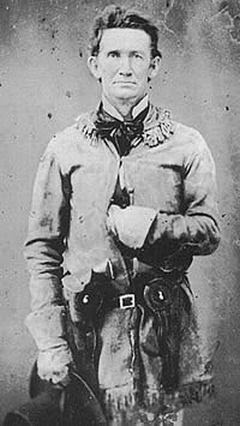 In 1859, he joined other Texas Rangers to fight the notorious Mexican bandit/general Juan Cortina at the Battle of Rio Grande City. In 1861, Ford was part of the Secession Convention, and initiated a trade agreement between Mexico and the Confederacy. A Colonel in the Conferate army, he had command of the Rio Grande Military District. The same year, he defended Zapata County in the Second Cortina War against Mexicans who didn't want Texas in the Confederacy. He ran the Bureau of Conscription for Texas, and in May, 1865, he led Confederate forces against the Union in the Battle of Palmito Ranch, the last battle of the Civil War—which took place one month after Lee's surrender at Appomatox, but word of the surrender had not reached south Texas. In the battle, some of the 62nd Colored Regiment of the Union Forces were captured. They had been told if captured they would be shot or returned to slavery, but Ford had them all paroled and released with the white prisoners. After the war he insisted the negroes had the right to vote. In later years, Ford acted as a guide for the U.S. military operating against "cow thieves and other disturbers of peace and quietude" and was a correspondent for the Galveston News, and also worked for other newspapers. He died in 1897. I think we could use a few men like Rip Ford now. Thanks for the interesting post! Hi Laurie, thanks for the interesting post. While we lived in Austin, one of our favorite day trips to take out-of-state family and friends was to the Texas Ranger Hall of Fame and Museum in Waco. Their Research Center offers a genealogy search service. None of my folks have ever aspired to be a Ranger, but one of my historical YA heroes in the second book of the Butcher Boys Chronicles may see Mr. Ford as his role model. Thanks for the scoop. Linda, I've been to that museum too. Neat place! Thanks for commenting. Loved reading more about Rip Ford. I made him the uncle of my heroine in my Civil War novel set in Texas, His Steadfast Love. She took information to him which she had overheard from Union soldiers quartered in their house in Indianola on the Gulf Coast of Texas. There was a prisoner of war camp named after him, Camp Ford, near Tyler, TX, which one can still walk through. He must have been quite a man and patriot. Golden, I'm going to have to get that book now! Thanks for commenting. Does Ford have any descendants still living in Texas? I have been to his grave in San Antonio's Confederate Cemetery.